Saudi Arabia’s social services system aims to ensure every citizen a decent standard of living. This commitment to the well-being of the community underlies the Kingdom’s social stability and is in line with Islamic principles. Saudi Arabia offers a wide range of social welfare programs. Administered by the General Organization for Social Insurance (GOSI), key programs support workers or their families in cases of disability, retirement and death. A plan to cover employees who suffer occupational hazards was instituted in 1982 and has since helped millions of workers. Another major program provides social security pensions, benefits and relief assistance to the disabled, elderly, orphans and widows without income. The Kingdom continues to ensure that the assistance meets its recipients’ needs by increasing the monthly stipends of social security recipients depending on individual status and need. These programs are also mindful of patients’ comforts and sensibilities. Whenever possible, care is provided at home rather than in an institution. 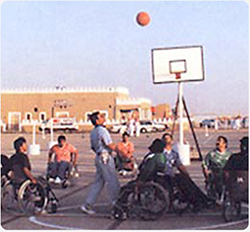 Saudi Arabia also offers facilities to treat and rehabilitate the mentally and physically disabled. One type of facility offers services for medical, physical and mental treatment and rehabilitation of patients. There are currently 18 such centers, operated or supervised by the Ministry of Health. A second type of facility focuses on the social rehabilitation of the handicapped. These are run by the Ministry of Social Affairs. Centers throughout the country teach the mentally and physically impaired social, educational and vocational skills so that they can enter society as independent, productive individuals. There are also special education institutes for the blind and the deaf throughout Saudi Arabia, and centers for disabled children. Non-profit organizations also help people with special needs. an example is the Jeddah Institute for Speech and Hearing (JISH), established in 1993, which offers advanced services for those with speech and hearing deficiencies. The Help Center in Jeddah (Markaz Al-Aoun), established in 1986, offers programs for children with physical and mental disabilities.